I've had my heart set on a Kitchenaid for a long time, but each time I visit the store, I leave without getting it coz I wanted more time to ponder over the colour. I spent many weekends at Tangs thinking and rethinking the choice of colour. I know that I love love love this Ice Blue mixer but the Tangerine one which is my second choice, is $100 cheaper at Tangs. Orange is the colour of Tangs thus they actually sell the tangerine Kitchenaid a special price. 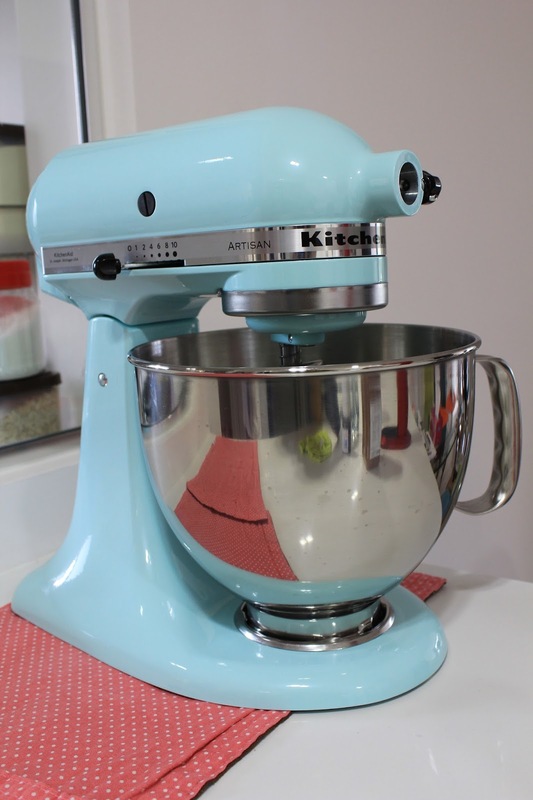 Well, I finally bought this really heavy mixer in Ice Blue. The kiddo and I embarked on our first baking project in our new place and we decided to bake some cinnamon rolls. I love love love cinnamon rolls but it is soOOooo difficult to find them in Singapore. My daughter's living idol is a Laura Vitale, a bubbly Italian lady who resides in the states and she is what the kiddo loves to watch on YouTube. Noticed that I mentioned 'living idol'? Coz her other idols are Barbie princesses and all the Disney princesses, thus that makes Laura Vitale the only human lady that she adores ... hehehe... OK, we made use of Laura's cinnamon roll recipe and we watched and rewatched the video and the kiddo knows exactly what Laura's instructions are. 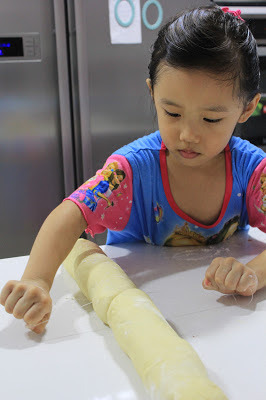 Kiddo: I'll use a rolling pin to roll out the dough. Me: We don't need a rolling pin. We'll use our hands. Kiddo: NO! Laura Vitale said we can use our hands OR the rolling pin. So, I went back to the video and fast forward to the part where Laura was flattening the dough. Yups, true enough, Laura said just that. And slicing the log into smaller pieces using a floss. 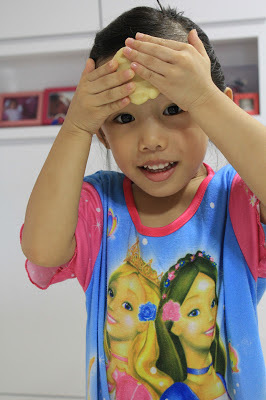 Since we had to wait for some time for the dough to rise, I though i'd teach her to form braids. When everything's risen and gone into the oven, here are the final products. I believe that we sliced the log too thin... hehee coz the cinnamon roll looks like a thick sultana danish rather than a thick sinful cinnamon roll. Tastes great though! Before I placed the cinnamon rolls into the over, I thought why not bake the kiddo's braid too since I had space in the baking pan. She looked really surprised when she found out what I had done. Of coz no one ate this braided bread coz she was using it as Play Doh and kneading it with way too much zest and mess before it went into the oven. Talk to you ladies soon!!!! The rolls look super yummy!!! And light blue kitchen aid looks so retro and cute! The Kitchenaid is lovely yeah? I think all the colours look fab! Wow the rolls look so good and your little kiddo is growing up to be such a big girl now! i have a qn, will the heat from oven damage the microwave since it is on top of the oven?